Busy year of production in 2012 for Nautor´s Swan – Superyachts News, Luxury Yachts, Charter & Yachts for Sale. After a successful final quarter in 2011, Nautor’s Swan, manufacturers of luxury yachts, are looking forward to a busy year in 2012 with the yard in Pietarsaari, Finland, almost at capacity with a combination of new build projects and a number refits taking place. Currently under early stages of production are two of the newest model to join the SwanLine for 2012, the new Swan 100. Both sailing yachts Swan 100 have commenced before the yacht model has been actively launched to the market, confirming the route that Nautor’s Swan have elected to take in focusing upon cruising practicality and spaciousness of a classic blue water cruiser, combined with the sleek high end performance pedigree of the well-established SwanLine. The first super yacht Swan 100 will be launched and sailing during the summer of 2013. The number of Maxi’s produced by Nautor’s Swan continues to grow with sailing yachts Swan 90, Swan 82 and Swan 80 currently under construction, all due to launch during the summer of 2012. 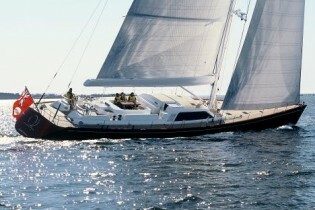 The Swan 60 yacht fleet continues to grow in numbers with construction underway on a new model, also due for launch for summer of 2012. In addition to the new builds in the Superyacht and Maxi range, Nautor’s Swan are also at varying stages of construction with four new Swan 53 yachts, one of the smaller models within the SwanLine with cruising at her core, providing the perfect solution for owners looking for a mid-range Swan which truly reflects Nautor’s philosophy of quality, style and seaworthiness. Running alongside the construction of the mix of models from the 2012 SwanLine at the yard will be three significant refit projects – yachts Swan 90, Swan 82 and Swan 46. The scope of the project on each is substantial with all three undergoing a complete interior and exterior refit and refurbishment. Enrico Chieffi, Managing Director of Nautor’s Swan, commented “We are delighted with the progress that we have made through 2011. The build slots for 2012 are now almost fully booked which in today’s market is a promising start for the New Year. The new Swan 100S moving from plans and design to a reality under construction with two orders has been an exciting process to lead. We are looking forward to dynamically promoting her around the world during 2012 and believe many of our existing and prospective owners will be drawn to some of the unique developments she will feature”.